Replacement sediment bottle for Williams Warn 10L Brewkeg. 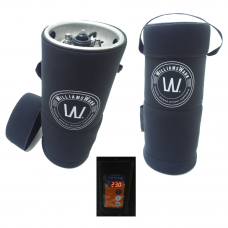 Portable dosing device to dose WilliamsWarn Clarification Agent into any number of BrewKegs. On the gas side, it connects to a gas bottle or gas line and on the output side it connects to the beer out port on the lid of the BrewKeg. The BrewSnug10TM is a neoprene fitted jacket with built in temperature controller and heating band designed specifically for the BrewKeg10TM. As a stand alone heating device, the BrewSnug10 allows brewers to maintain a minimum brewing temperature for fermentation without the need to tie up a beer serving fridge for the same purpose when they'd prefer to be drinking from the fridge! Replacement seal part for a Williams Warn BrewMaster system. Perfect for opening your Brewkeg 25L / 50L Brewkeg. For those who are just wanting to purchase an additional BrewKeg10™ or already have the accessories listed in BrewKeg10™ starter pack. 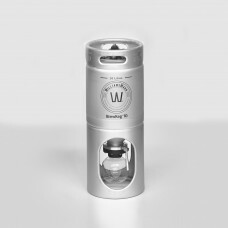 If you love beer or cider and have ever dreamed of crafting your own fresh brews at home – Williams Warn have come up with just the product to match all budgets. The BrewKeg10™ is the newest addition to the Williams Warn family of award winning equipment and beer/cider. In as little as 4-7 days with 10-20 minutes of effort you can very cost effectively produce premium beverages. All you need is a room with an ambient temperature 18-28°c for fermentation, a fridge for cooling/clarification and a little enthusiasm! Dispense directly from the BrewKeg10™ or transfer to bottles, growlers or kegs using our accessories and start another brew. 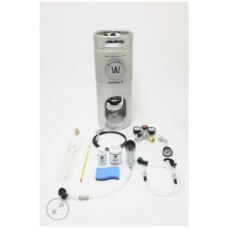 Brew and dispense 10L of world class beer or cider directly from your BrewKeg10™ in 4-7 days. For those who will ferment in a room with an ambient temperature 18-28°c for fermentation and a fridge for cooling/clarification their own fridge for cooling this is the starter pack for you! Includes a BrewKeg10™, BrewKeg10™ Sundry Accessory pack, 50ml Dosing device, BrewKeg10™ Pressure Gauge, beer dispense line with plastic tap, gas dispense line, Micromatic regulator and soda stream adapter (soda stream bottle sold separately). A 60L Soda Stream will last 4-5 BrewKeg10™ brews when dispensing directly from the BrewKeg10™. For those who have multiple BrewKeg10s™ and/or dispensing kegs a 4.5kg Co2 cylinder may be more appropriate. A heavy duty stainless steel wheel set that can be attached to the stand, to hold the weight of a full BrewKeg and enable it to be moved easily from fermentation area to the chiller. Each BrewKeg50™ can produce 50 litres of beer or cider in 5-7 days with no formal training required. With only 20-30 minutes work required per week anyone can produce premium beer or cider at significantly less than the cost of commercially equivalent beverages. Brew and dispense from the BrewKeg™ or transfer with WilliamsWarn accessories to Corny kegs, growlers or bottles and immediately start a fresh brew. The system only needs a room with an ambient temperature for fermentation (18-25ºC) and a fridge or chiller for cooling and clarification. The BrewKeg50™ is perfect for all-grain brewers to carbonate, clarify and dispense a brew all in the one vessel or you can use the WilliamsWarn product range which are malt extract kits made to the highest standards. The ingredients deliver the base for almost unlimited creativity to custom brew whatever you enjoy drinking.